(CNN) - With just over a week to go until the runoff, the two candidates in the Republican Senate primary in Georgia are sharpening their attacks on each other. 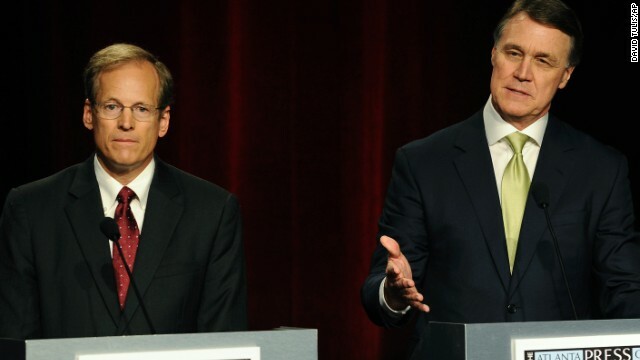 Rep. Jack Kingston and businessman David Perdue fired away at each other as Sunday night's one and only televised debate between the two candidates turned into a testy affair. The winner of the July 22 runoff will face off against Democrat Michelle Nunn in November's general election. Perdue, a former CEO of Dollar General and Reebok, repeatedly blasted the 11-term congressman as being part of the problem in Washington. "This is a problem when you have an out of touch Congress, led by a career politician whose first priority is to get re-elected. This is a travesty," said Perdue, adding that "right now we are spending a third of what we should be spending as a country on all of our infrastructure. And because of that we're becoming less and less competitive around the world. On this congressman's watch over the last 22 years, we have lost our competitive edge against many parts of the world. And it's time to change that." Kingston touted his commitment to his constituents in his coastal Georgia district and fired back at Perdue. "Let me talk to you about being out of touch. I've come home every single weekend. I've had open mike town meetings. I work with people who disagree with me. David, you whole lifestyle is based in a different way. Now you have done well for yourself. But you live in a gated community, inside a gated community and have a gate at your house. How are you going to work with John Q. Public when they come up to you and have questions? I think being part of a public servant is being public and being a servant. Knowing who you're working for and being accessible to them is extremely important," Kingston said. Perdue has poured more than $3 million of his own money into his campaign. That's helped him keep pace with Kingston, who began the race with a large war chest and has dominated fundraising. Kingston also enjoys the support of the U.S. Chamber of Commerce, which has run ads backing the congressman. Perdue's first cousin, former two-term Georgia Gov. Sonny Purdue, will appear in Perdue commercials in the campaign's final week. Another high profile supporter, 2012 GOP presidential candidate Herman Cain, will appear in radio spots. The latest polls suggest the race between the two candidates is close. Perdue and Kingston finished first and second in the May primary, beating out three more conservative candidates, Reps. Phil Gingrey and Paul Broun and former Georgia Secretary of State Karen Handel. Nunn easily won the Democratic primary, as she tries to follow in the footsteps of her father, former longtime Sen. Sam Nunn. The winner of the November election will succeed retiring Republican Sen. Saxby Chambiss. Democrats have a 55-45 majority in the Senate (53 Democrats and two independents who caucus with the party). But in the midterms, the party is defending 21 of the 36 seats up for grabs, with half of those Democratic-held seats in red or purple states. Democrats see Georgia as one of only two states, along with Kentucky, where they hope to go on offensive in the battle for the Senate. Kingston has a couple of ads with a phoney Obama, saying "Kingston, this is the president. You've got to back off Obamacare," and, on Perdue: " he's my kind of guy.” All while Kingston is begging for more Federal money for the port of Savannah. Totally Low-Life. Neither men are conservative enough for true RWNJ status. They just want to convince the RWNJs to vote for them. Maybe the Dem voters will turn out in numbers in November and send Ms Nunn to the Senate. P.S.-Dow broke another record. Obama is destroying this Country. Obama has kept millions unemployed for a record length of time while running up $8 TRILLION in debt. That is what is hurting Americans. The stock market is making rich people even richer. Most Americans aren't in the stock market. You need to extract your head from the backside to understand that Wall St. =/= Main St.
Mud slinging in a campaign should be an automatic disqualification. The election process should not be about who is less of a jerk but who has the best ideas and how they plan on caring out those plans. America needs leaders that are truly public servants. Not 11 term do nothing hacks just their to further their career and collect a pay check. I would be willing to bet the USA has spent more on paying worthless do nothing political figures than they have on welfare and medicaid for people that truly need the assistance. The USA has certainly paid government contractors that build bombs and tanks more than they have helping our own people. The fact is there are a large number of people on welfare that don't need it, but there are a greater number that do. The GOP makes certain you only hear about the minority that take advantage of the system. "The GOP makes certain you only hear about the minority that take advantage of the system." Well at least fox makes certain, and they will make up a fictitious character, hire someone to play the part, and then outright lie to viewers to drive the point home. Then blame obama for policy enacted in 2003 or some nonsense. ....and of course if the stock market was down the right wing would be saying "see, see? That proves the economy is bad". What happened to trickle down anyway? When the rich do well doesn't everything get better by magic? Another double speak ranting point. Who cares? HILARIOUS watching Guns over People teatards eat each other as they walk the plank toward another November. What was the deficit when Obama took over, nine trillion, really lmao, add the bailout needed you know tax breaks, coupled with two unfunded wars. You do know there is a simple way for you to get the real numbers concerning our deficit, bug that's not really what you want, is it? The deficit I'd going down, that's right sport, but you won't believe it unless fox news says so, I could never repeat what I heard on that station, and seriously not feel like a idiot. I did watch, then doing other research, quickly realised how badly they lied, about every issue. But your not about yo do that, you'd rather have the whitd guys in charge, and continue to watch your country go down the toilet. And what happens if we soon really need a strong army, that's decimated for years to, thanks to George, no one will help us, we screwed them on the Iraq thing, they won't do it again. Tommy, you know most working americans, with real jobs have a 401k, which like it or not, is tied to, if not fully vested in that same stock market, you don't work or what? people are not rich nor do they have their head in their backside. What happened to trickle down? By their own definition, trickle down would constitute a transfer of wealth, something which we all know that their puppet masters are too greedy to tolerate. 'You're on your own." But you sure do believe in trickle down government spending right?! When the government takes more and spends more and gives more out to everybody, everybody does just great right? Then please do explain the record food stamp recipients, record unemployment, record debt, record government dependents. I guess the left calls that success, a country full of government dependents. Tommy, open your eyes, is it still dark? Does the air seem stale, and noxious? Then i propose to you that you, in fact, have yours up yours. That's a conclusion some have come to long ago, btw.